Is the IP regulation system fair? The Insolvency Service’s 2015 review of IP regulation was released in March and, as usual, I’ve dug around the statistics in comparison with previous years. 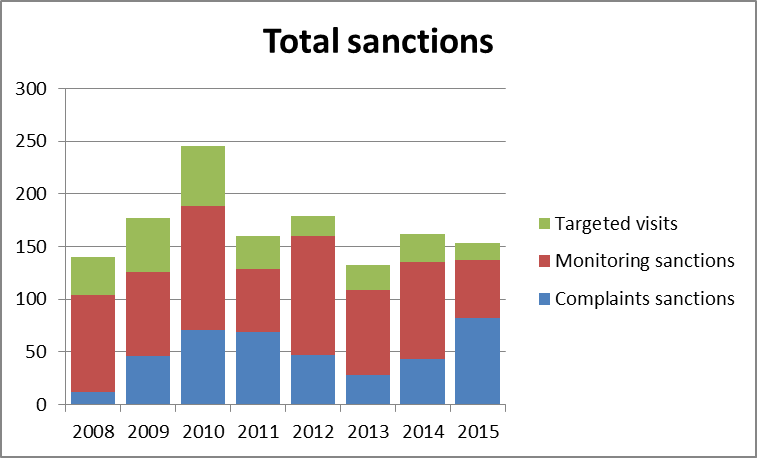 They indicate that complaint sanctions have increased (despite complaint numbers dropping), but monitoring sanctions have fallen. Why is this? And why was one RPB alone responsible for 93% of all complaints sanctions? The Insolvency Service’s report can be found at https://goo.gl/HlATlf. I honestly had no idea that the R3 member survey issued earlier today was going to ask about the effectiveness of the regulatory system. I would encourage R3 members to respond to the survey (but don’t let this blog post influence you!). I guess it was inevitable: no IP welcomes the hassle of switching authorising body and word on the street has always been that being authorised by the SoS is a far different experience to being licensed by an RPB. Therefore, I think that the withdrawal from authorising by the SoS (even with a run-off period) courtesy of the Deregulation Act 2015 and the Law Societies was likely to affect the IP numbers. As you can see, the remaining RPBs have not gained all that the SoS and Law Societies have lost and ACCA’s and CARB’s numbers have dropped since last year. It is also a shame to note that, not only has the IP number fallen for the first time in 4 years, it has also dropped to below the 2010 total. Personally, I expect the number to drop further during 2016: I am sure that the prospect of having to adapt to the new Insolvency Rules 2016 along with the enduring fatigue of struggling to get in new (fee-paying) work and of taking the continual flak from regulators and government will persuade some to hang up their boots. I also don’t see that the industry is attracting sufficient new joiners who are willing and able to take up the responsibility, regardless of the government’s partial licence initiative that has finally got off the ground. 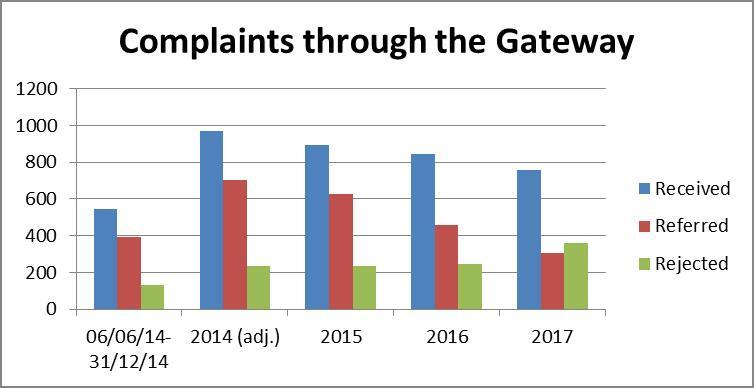 But what interests me is that the number of sanctions in 2015 arising from complaints far outstripped those arising from monitoring visits, which seems quite a departure from the picture of previous years. What is behind this? Is it simply a consequence of our growing complaint-focussed society? 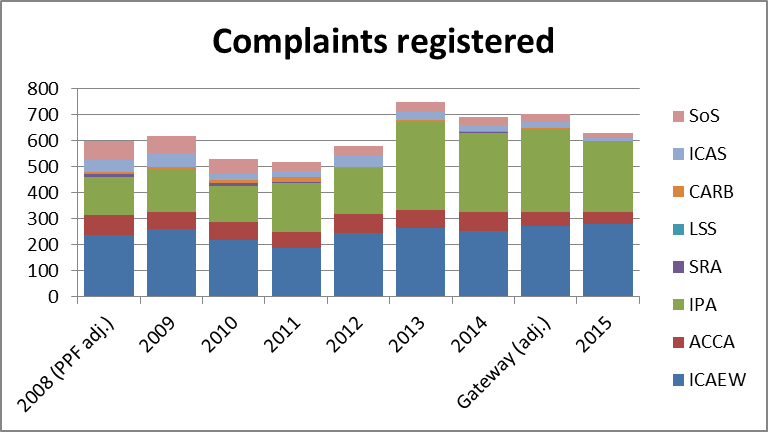 Well actually, as you can see here, it seems that fewer complaints were registered last year… by quite a margin. I confess that some of these years are not like-for-like comparisons: before the Complaints Gateway, the RPBs were responsible for reporting to the Insolvency Service how many complaints they had received and it is very likely that they incorporated some kind of filter – as the Service does – to deal with communications received that were not truly complaints. However, it cannot be said for certain that the RPBs’ pre-Gateway filters worked in the same way as the Service’s does now. 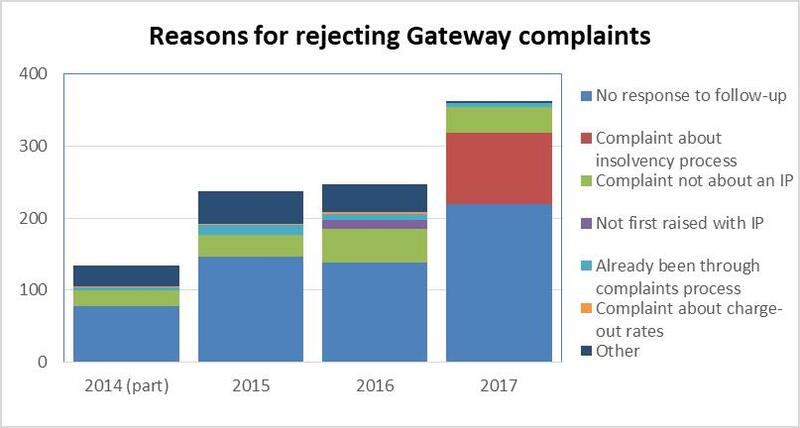 Nevertheless, what this graph does show is that 2015’s complaints referred to the regulatory bodies were less than 2014’s (which was c.half a Gateway year – the “Gateway (adj. )” column represents a pro rata’d full 12 months of Gateway operation based on the partial 2014 Gateway number). 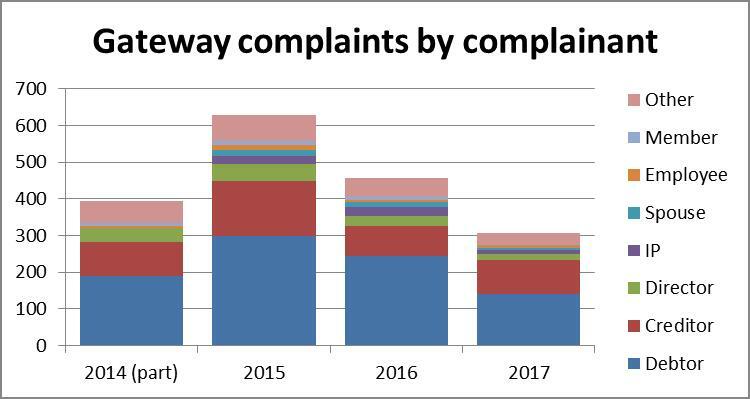 It is also noteworthy that the Insolvency Service is chalking up a similar year-on-year percentage of complaints filtered out: in 2014, this ran at 24.5% of the complaints received, and in 2015, it was 26.5%. 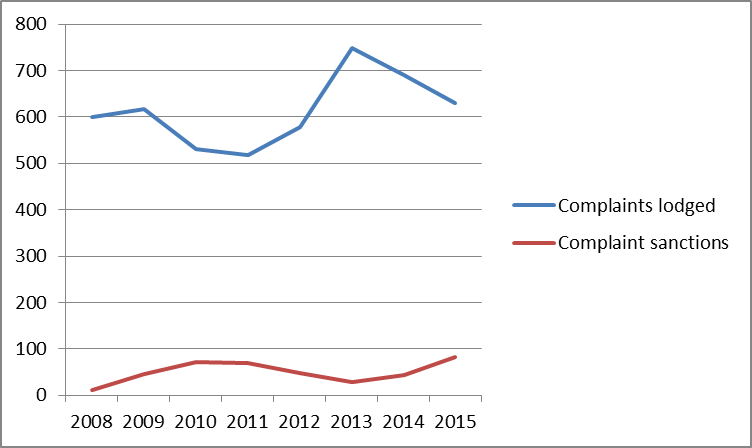 So, if there were fewer complaints lodged, then why have complaints sanctions increased? How long does it take to process complaints? Is it too great a stretch of the imagination to suggest that complaint sanctions take somewhere around 2 years to emerge? 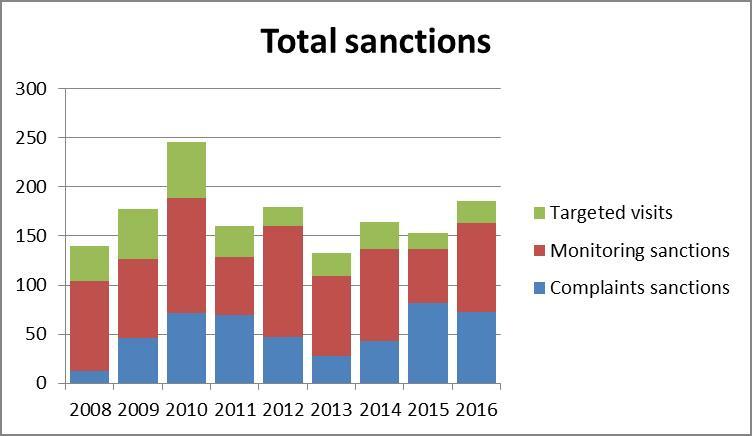 I suggest this because, as you can see, the 2010/11 sanction peak coincided with a complaints-lodged trough and the 2013 sanctions trough coincided with a complaints lodged peak – the pattern seems to show a 2-year shift, doesn’t it..? I am conscious, however, that this could simply be a coincidence: why should sanctions form a constant percentage of all complaints? 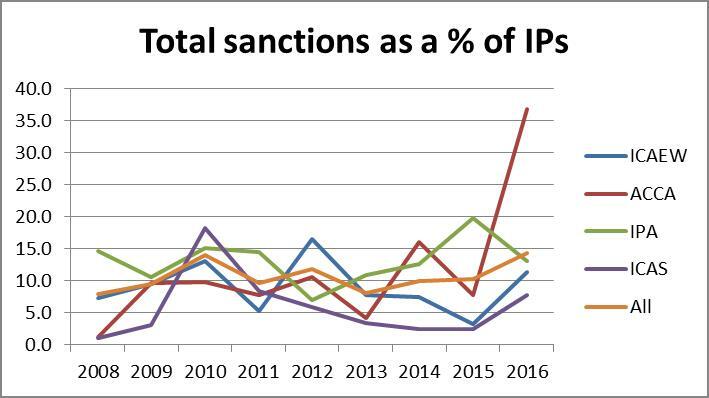 Perhaps the sanctions simply have formed a bit of a random cluster in otherwise quiet years. 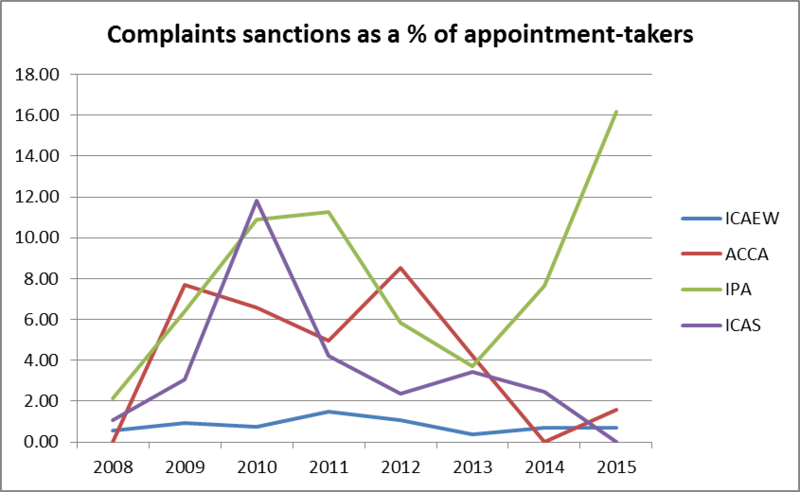 Could there be another reason for the increased complaints sanctions in 2015? How strange! Why has the IPA issued so many complaints sanctions when compared with the other RPBs? I have heard more than one IP suggest that the IPA licenses more than its fair share of IPs who fall short of acceptable standards of practice. Personally, I don’t buy this. Also more sanctions don’t necessarily mean there are more sanctionable offences going on. It reminds me of the debates that often surround the statistics on crime: does an increase in convictions mean that there are more crimes being committed or does it mean that the police are getting better at dealing with them? Nevertheless, the suggestion that the IPA’s licensed population is different might help explain the IPA peak in sanctions, mightn’t it? To test this out, perhaps we should compare the number of complaints received by each RPB. 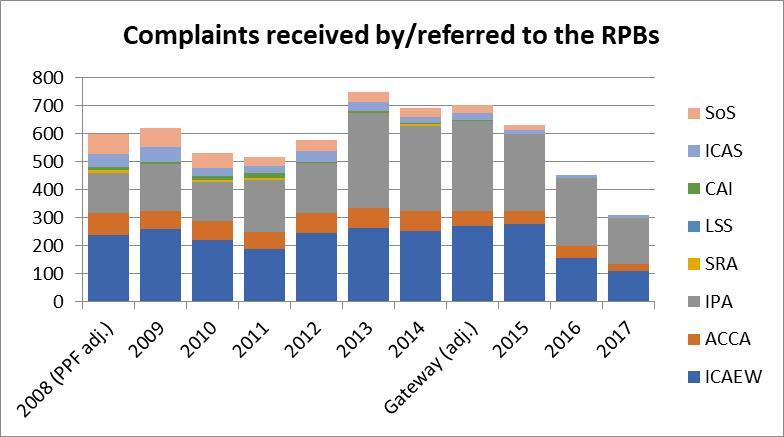 Ok, so yes, IPA-licensed IPs have received more complaints than other RPBs (although SoS-authorised IPs came out on top again this past year). If the complaints were shared evenly, then 58% of all IPA-licensed IPs would have received a complaint last year, compared to only 43% of those licensed by the other three largest RPBs. I hasten to add that, personally, I don’t think this indicates differing standards of practice depending on an IP’s licensing body: it could indicate that IPA-licensed (and perhaps also SoS-authorised) IPs work in a more complaints-heavy environment, as I mention further below. 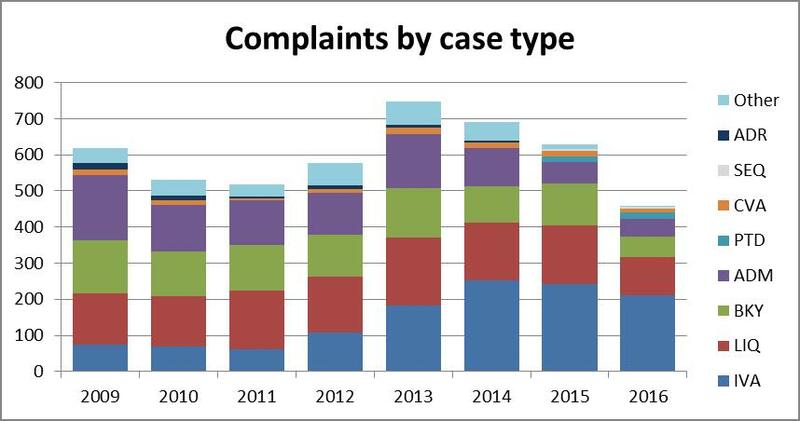 Nevertheless, let’s see how these complaints-received numbers would flow through to sanctions, if there were a direct correlation. For simplicity’s sake, I will assume that a complaint lodged in 2013 concluded in 2015 – although I think this is highly unlikely to be the average, I think it could well be so for the tricky complaints that lead to sanctions. 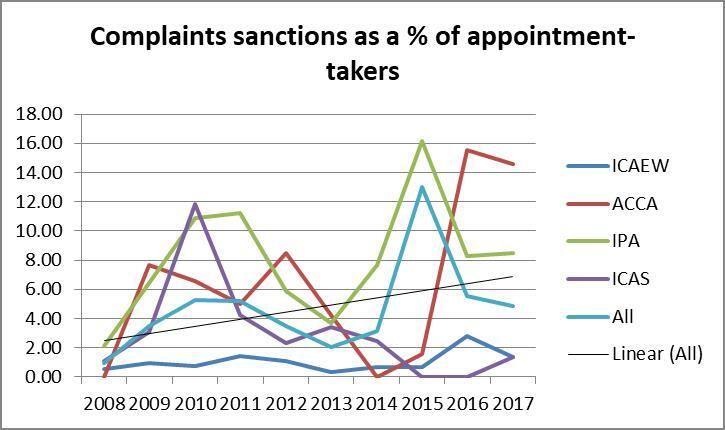 This would mean that, across all the RPBs (excluding the Insolvency Service, which has no power to sanction SoS-authorised IPs in respect of complaints), 12% of all complaints led to sanctions. On this basis, the IPA might be expected to issue 36 complaint-led sanctions, so this doesn’t get us much closer to explaining the 76 sanctions issued by the IPA. 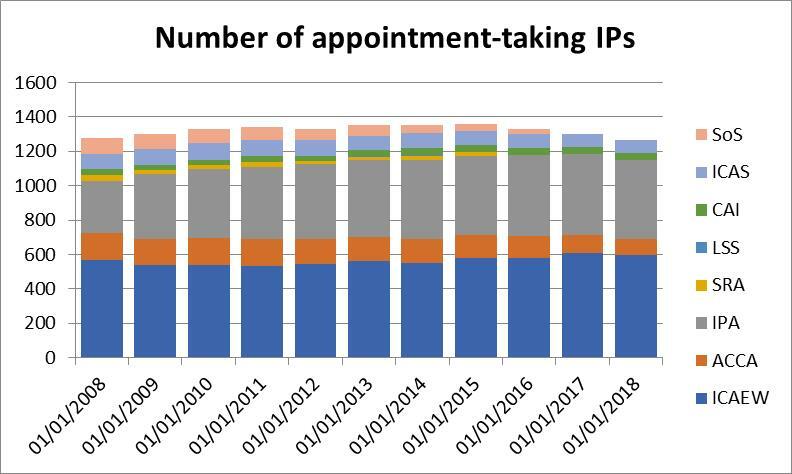 The IPA licenses the majority of IVA-specialising IPs, which do seem to have attracted more than the average number of sanctions: last year, two IPs alone were issued with seven reprimands for IVA/debtor issues. The IPA’s process is that matters identified on a monitoring visit that are considered worthy of disciplinary action are passed from the Membership & Authorisation Committee to the Investigation Committee as internal complaints. Therefore, I think this may lead to some IPA “complaint” sanctions actually originating from monitoring visits. 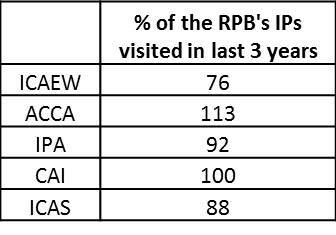 However, analysis of the sanctions arising from monitoring visits (which I will cover in another blog) indicates that the IPA sits in the middle of the RPB pack, so it doesn’t look like this is a material factor. Connected to the above, the IPA’s policy is that any incidence of unauthorised remuneration spotted on monitoring visits is referred to the Investigation Committee for consideration for disciplinary action. Given that it seems that such incidences include failures that have already been rectified (as explained in the IPA’s September 2015 newsletter) and that unauthorised remuneration can arise from a vast range of seemingly inconspicuous technical faults, I would not be surprised if this practice were to result in more than a few unpublished warnings and undertakings. But this cannot be the whole story, can it? 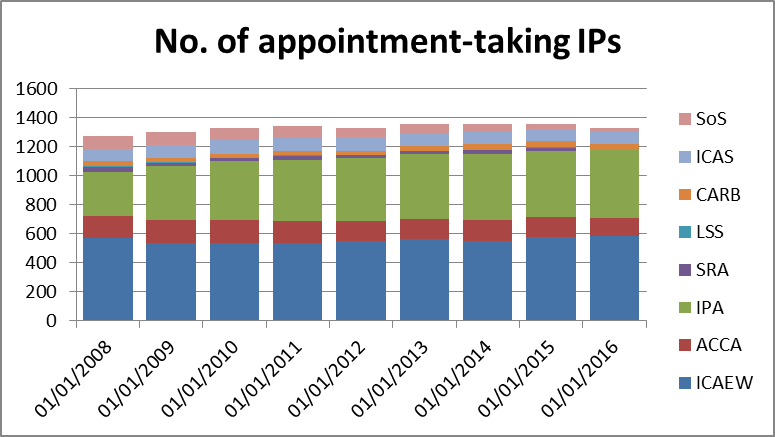 The IPA issued 93% of all complaints sanctions last year, despite only licensing 35% of all appointment-takers. 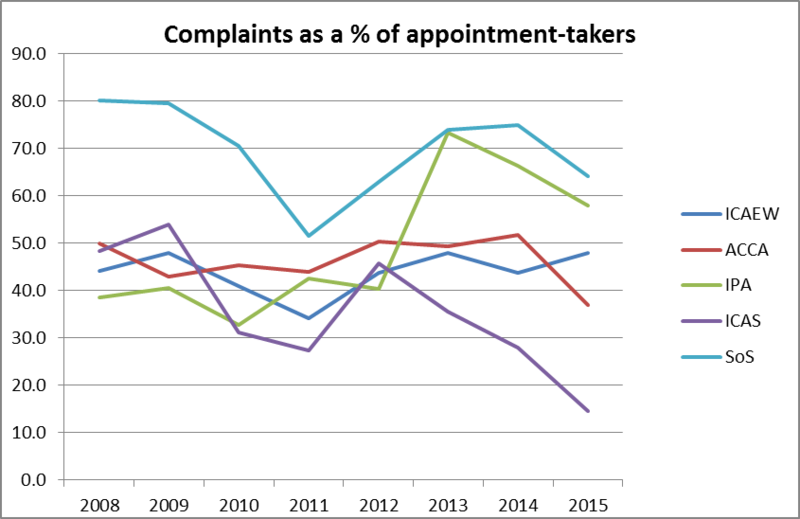 The previous year followed a similar pattern: the IPA issued 82% of all complaints sanctions. To put it another way, over the past two years the IPA issued 111 complaints sanctions, whilst all the other RPBs put together issued only 14 sanctions. What is going on? It is difficult to tell from the outside, because the vast majority of the sanctions are not published. Don’t get me wrong, I’m not complaining about that. If the sanctions were evenly-spread, I could not believe that c.16% of all IPA-licensed IPs conducted themselves so improperly that they merited the punitive publicity that .gov.uk metes out on IPs (what other individual professionals are flogged so publicly?!). This incongruence, however, makes me question the fairness of the RPBs’ processes. It cannot be fair for IPs to endure different treatment depending on their licensing body. You might say: what’s the damage, when the majority of sanctions went unpublished? I have witnessed the anguish that IPs go through when a disciplinary committee is considering their case, especially if that process takes years to conclude. It lingered like a Damocles Sword over many of my conversations with the IPs. The apparent disparity in treatment also does not help those (myself included) that argue that a multiple regulator system can work well. One of the new regulatory objectives introduced by the Small Business Enterprise & Employment Act 2015 was to secure “fair treatment for persons affected by [IPs’] acts and omissions”, but what about fair treatment for IPs? In addition, isn’t it possible that any unfair treatment on IPs will trickle down to those affected by their acts and omissions? The Insolvency Service has sight of all the RPBs’ activities and conducts monitoring visits on them regularly. Therefore, it seems to me that the Service is best placed to explore what’s going on and to ensure that the RPBs’ processes achieve consistent and fair outcomes. 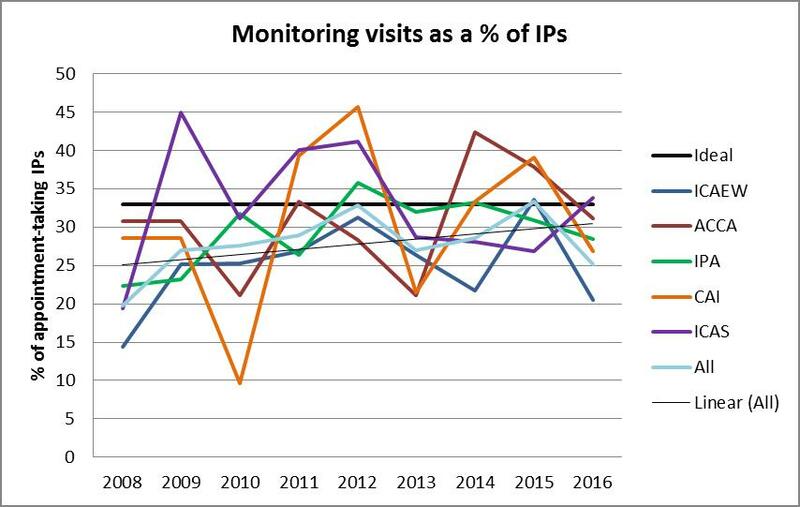 In my next blog, I will examine the Service’s monitoring of the RPBs as well as take a closer look at the 2015 statistics on the RPBs’ monitoring of IPs. Categories: Insolvency Service, Other reports | Tags: complaints, Complaints Gateway, insolvency practitioners, insolvency service, regulation, RPBs | Permalink. SIP1: must you make a formal complaint? Sorry for the long silence. SIP9/fees have ruled my life for the past few months and I’ll share my thoughts on those when the fog has cleared. In the meantime, I thought I’d catch up on something far less controversial (you’d think! ): SIP1’s requirement to “report” IPs to the Complaints Gateway or to the RPB. Does this mean that reports will be handled as full-blown complaints or is there another way? Why shouldn’t all reports be handled as formal complaints? Well, imagine you are a licensed IP working for other licensed IPs. Maybe you’re in that boat now. Maybe you’re in a firm’s compliance department. Maybe you’re a case manager. Say you become uncomfortable about something you’ve seen, something that you think triggers the SIP1 reporting requirement. Should you to report it via the Insolvency Service’s Complaints Gateway? What would happen next? Would the RPB write to the IP providing a copy of the report? The IPA’s complaints procedure, for example, states that this is done in all complaint cases. Clearly, this is unhelpful. But does elevating the need to report concerns to a SIP requirement rule out any alternative to lodging a formal complaint? Does SIP1 allow IPs to discharge their reporting duty by whistle-blowing to the RPB? This appears to give IPs a choice: either they may lodge a (formal) complaint via the Gateway or they can report to the IP’s RPB. What is the destiny of a “report” to the RPB? The MoU between the Insolvency Service and the RPBs (https://goo.gl/ICqHEo) suggests that there is no practical distinction. It defines a complaint as “a communication about a person authorised as an insolvency practitioner expressing dissatisfaction with that person’s conduct as it relates to his or her professional work as an insolvency practitioner in Great Britain, or with the conduct of others carrying out such work on that person’s behalf.” The MoU then states: “Each Recognised Professional Body will forward to the Authority any Complaint received by it within five Working Days of receipt” and then the Authority, the Insolvency Service, will process the Complaint in the usual manner. So this would appear to complete the circle. It appears that however an IP seeks to report a matter, it is going to be handled as a complaint sooner or later. Is there no way to whistle-blow to a regulatory body? So it seems that all reports will end up in the Complaints Gateway. This seems wrong, doesn’t it? After all, the Insolvency Service is a “prescribed person” for the purposes of whistle-blowing about misconduct in companies generally (https://goo.gl/cIkGL4). It doesn’t make sense to leave those working within the insolvency profession with nowhere to turn. Surely the Service appreciates that IPs (and others employed by IPs) might want to use a far more discreet method than a formal complaint to bring their concerns to the attention of the regulatory bodies. I certainly hope that the Service would not look to enforce this aspect of the MoU against the RPBs. We must be able to trust our regulatory bodies to act sensibly when dealing with such sensitive situations. To be honest, I haven’t asked anyone at the Service for comments. 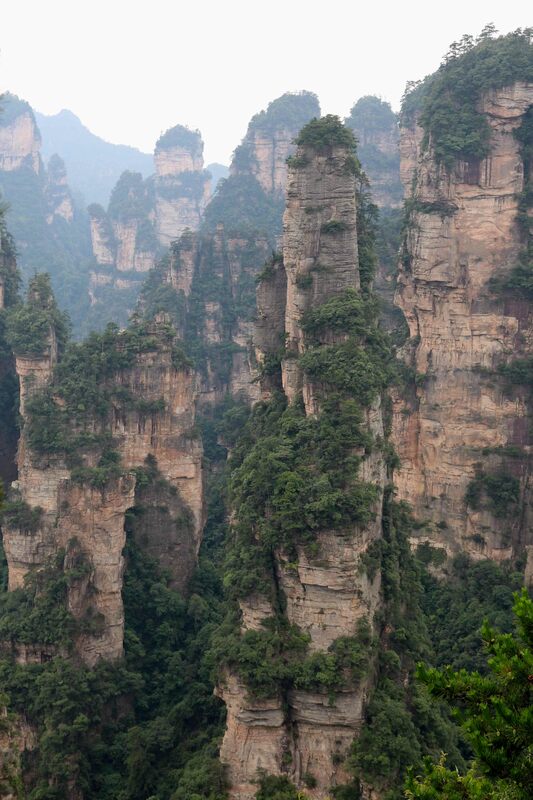 However, I have sought the views of some within the RPBs. Alison also pointed out that, as information may end up in the monitoring stream, it could result in a referral to the Investigation Committee (which deals with complaints). However, this would be a referral from the Membership & Authorisation Committee (which deals with monitoring), so I think the whistle-blower’s identity would be unlikely to feature in the “complaint” referral, as the chances are that the IPA’s monitoring team will have gathered their own evidence in order for the M&A Committee to consider the issue in the first place. I won’t quote my ACCA contact here, as it wasn’t an “official” response. Nevertheless, I did learn that ACCA’s monitoring team receives intelligence – from IPs as well as the other RPBs – and this is similarly absorbed into its monitoring processes, rather than put through the formal complaints process where the discloser doesn’t wish to lodge a formal complaint. I suspect also that this is the case with the ICAEW and, to be fair to them, they were hoping to revert to me with a consensus view once this matter had been discussed at the Regulators’ Forum a couple of months’ ago. I expect that the demands of other SIP revisions have overtaken the publication of any guidance on this matter. So whistle-blowing to the IP’s RPB can count as SIP1 compliance? From the comments I have received, it would seem so. It also seems to me that the RPBs would not treat it as a formal complaint and thus pass it to the Insolvency Service for processing via the Gateway. Confidential intelligence-delivery worked within RPBs before the revised SIP1. The revision certainly was not intended to close any doors that were previously open. What about your duty under your RPB’s Membership Rules? Within all the RPBs’ membership rules/regulations, there is an obligation to report the misconduct of another member. The purpose of the revised SIP1 was to expand this obligation so that, in effect, the same rules apply whether the offending IP is a member of your RPB or not. However, this means that, technically, if you have lodged a complaint via the Insolvency Service’s Gateway, you may need to report the matter also to your RPB so that you comply with its membership rules. This does seem a bit of unnecessary duplication, however, and I would hope that an IP would not be beaten about the head for complaining only to the Gateway. What acts should be reported? actions that discredit the profession. I am pleased to see that, at least with the IPA, its rules have been amended in the past few months clearly to bring them in line with the revised SIP1. Previously, their rules had stated “misconduct” needed to be reported, which could have constituted simply a breach of a SIP, statutory provision or the Ethics Code. Now, the IPA has also imported reference to discrediting the profession (although also, interestingly, discredit to either the member, the IPA, or any other member) as a must-have in order to trigger the reporting requirement. What actions discredit the profession? Actions at the far end of the spectrum will be blindingly obvious, but I reckon there is a huge swathe of greyness where subjectivity reigns. To be fair though, we have always lived with this issue. The revised SIP1 wasn’t meant to make our lives more difficult – I don’t think so anyway – but rather to emphasise our personal responsibility to keep our profession clean. With this objective in mind, I have no complaints about the revised SIP1. Categories: Other guidance | Tags: complaints, Complaints Gateway, insolvency service, RPBs, SIP1, whistle-blowing | Permalink. 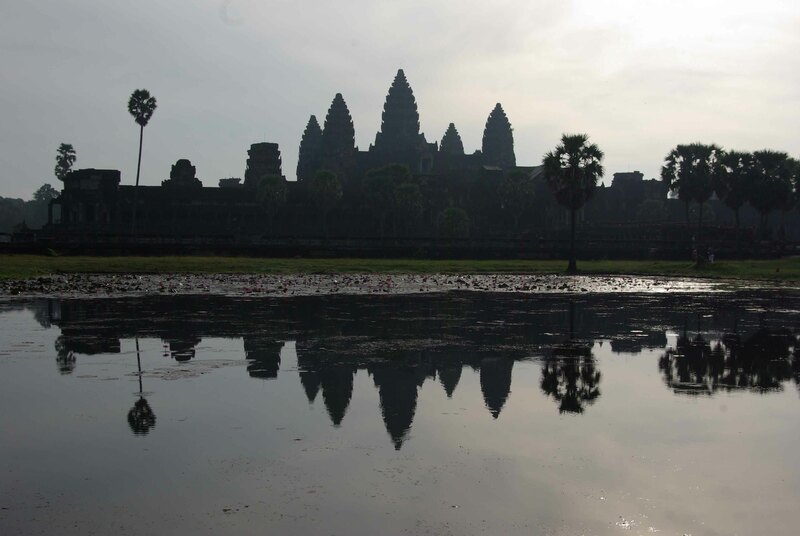 Having just returned from a fantastic trip to Vietnam and Cambodia, I have yet to catch up on domestic news, so I thought I’d plug the silence gap with some tips that I picked up from the RPBs’ autumn roadshows. Ethical issues featured heavily at the ICAEW roadshow, whilst the IPA roadshow raised some controversial Administration points, and both RPBs had much to say about handling complaints in the wake of the Insolvency Service’s Complaints Gateway. • In order to identify any prior relationships before deciding whether to take an appointment, do not rely solely on the company director signing off confirmation that s/he is not aware of any conflicts/relationships; internal checks are still required. • Ensure that relationships are evaluated, not merely identified. Allison gave the example of an IP who had noted on his ethics checklist that the director of the prospective appointment had been a director of eight other companies that had gone insolvent with the IP acting, but the checklist evidenced no evaluation of the threat to the ethical principles that these prior relationships presented. Personally, I have also seen cases – although not quite as striking as this – where a prior relationship existed but it was not noted on the ethics checklist. Even though an IP may have concluded that a relationship is not sufficiently significant to require the introduction of safeguards or to raise concerns about the appropriateness of taking the appointment, files should disclose the relationship and evidence the IP’s consideration of its significance. In my view, failure to do so, not only could constitute a breach of the Ethics Code (paragraphs 74 and 75), but is also bound to raise suspicions that checklists are completed on auto-pilot and insufficient thought is given to ethics matters. • Ensure that the IP signs off the ethics checklist, if not before the appointment, then as close to it as possible in order to demonstrate that consideration of ethical matters had been considered before appointment. 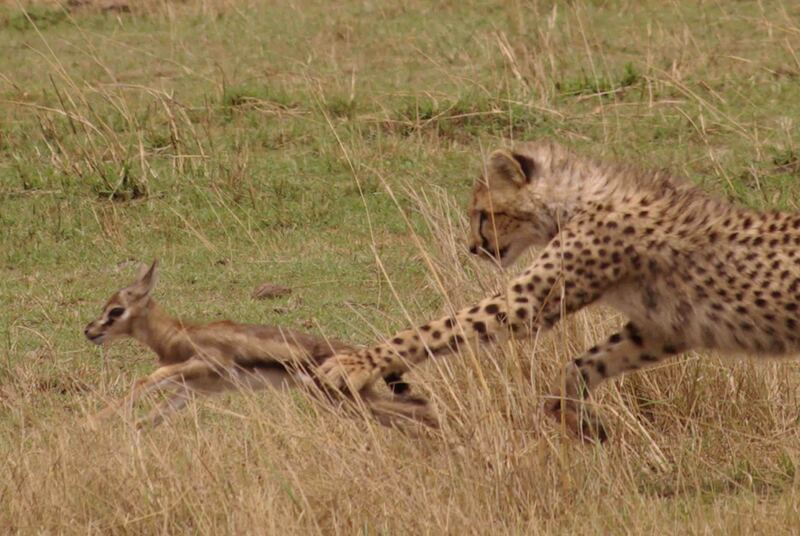 • Keep ethical threats under review throughout the life of the case, e.g. by including on case reviews a question – not a simple tick-box – as regards how any safeguards employed to manage a threat have been working. • Review regular introducers’ websites prior to taking the first appointment from those sources and regularly thereafter, as website contents are frequently refreshed. Allison acknowledged that pre-packs and phoenix services may be covered on websites, but she urged caution when dealing with introducers who position these items at the top of their lists or prominently. • If an IP feels that the quality of an introducer’s advice to directors/debtors is below par, it is not sufficient to allow the relationship to continue on the basis that at least the IP can ensure that s/he provides good advice. The ICAEW expects IPs to write to the introducer with any concerns and ask that changes be made to their websites and practices. They would then expect IPs to check whether these had been actioned and, if the introducer does not do so, the IPs should terminate the introduction relationship. Caroline described the Insolvency Service’s view that Administrators’ Proposals should describe only one of the Para 3 administration objectives that the Administrators propose to achieve. I have a problem with this: firstly, in what respect is this reflected by the statutory requirements? R2.33(2)(m) requires Proposals to include “a statement of how it is envisaged the purpose of administration will be achieved”. An old Dear IP (chapter 1, article 5) referred to this and also to Para 111(1) of Schedule B1, which states “’the purpose of administration’ means an objective specified in paragraph 3”, leading to the Service’s conclusion that “administrators should not simply include all three objectives with no attempt to identify which is the relevant objective”. That’s all well and good – and I think that IPs have moved away from many early-style Proposals, which did reproduce Para 3 verbatim – but I do not see how these statutory provisions require an IP to pin to the mast only one Para 3 objective to endeavour to achieve. Here’s an example: what would be wrong with an Administrator’s Proposals stating that the company in administration is continuing to trade with a view to completing a sale of the business as a going concern, which should generate a better result for creditors as a whole – and thus achieve administration objective (b) – but if a business sale is not possible, a break-up sale is likely to result only in a distribution to secured/preferential creditors – and thus achieve administration objective (c)? In my mind, this is the most transparent, comprehensive, and helpful explanation to creditors and certainly is far better than that which the Insolvency Service seems to expect IPs to deliver: for Proposals simply to state that a going concern sale is being pursued to achieve objective (b) is to provide only half the story and, I would argue, would not comply with R2.33(2)(m), as the Proposals would not be explaining “how it is envisaged the purpose of administration will be achieved” in the event that a business sale is not completed. Para 111(1) simply leads me to an interpretation that an Administration’s eventual outcome – not necessarily the Administrator’s prospective aim – is the achieving of a single objective, which is supported by the Act’s presentation of the objectives as an hierarchy notwithstanding that in practice it is easy to see how more than one objective might be achieved (e.g. 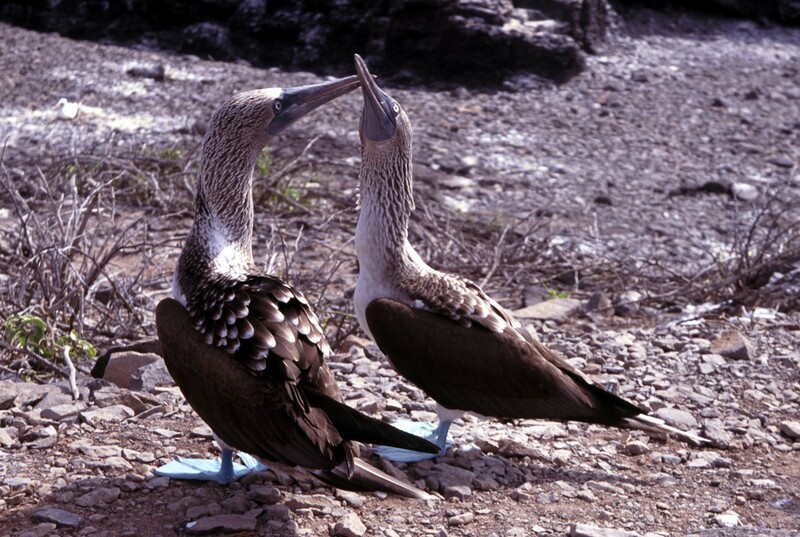 rescue of the company and a better result for creditors as a whole). At the roadshow, I asked Caroline whether she felt that, if the singly-selected objective turned out to be not achievable, the Administrator would need to go to the expense of issuing revised Proposals. 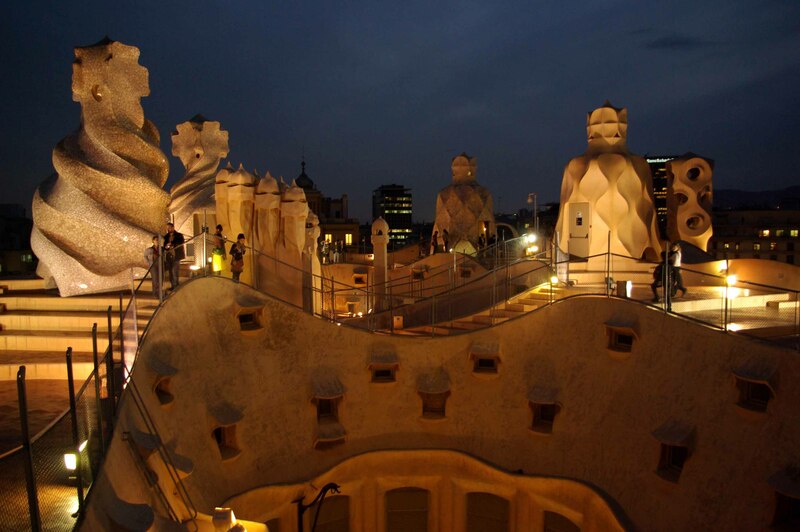 She accepted that, of course, the IP would need to consider that requirement (although I wonder how the decision in Re Brilliant Independent Media Specialists (https://insolvencyoracle.com/2014/10/07/how-risky-is-it-to-act-contrary-to-a-creditors-committees-wishes-and-other-questions/) impacts on this). Is this really what the government intended? What happened to the drive to eliminate unnecessary costs? Finally, I think that this view puts a new colour on the statutory requirement to issue Administrators’ Proposals as soon as reasonably practicable. Could it be argued that asarp is only reached once the Administrator is reasonably confident of the single objective that he/she envisages achieving? The RPBs have tried hard to promote the asarp requirement, rather than the 8-week back-stop, but insisting on a single objective in Proposals could encourage a turn in the tide. I have asked Caroline to clarify the Insolvency Service’s view. However, if the Service does expect IPs to adopt this approach, I think they should set it down in a Dear IP – of course, assuming that my arguments hold no water – so that all IPs are forced to accept the same burdens. Caroline repeated the Dear IP article that extensions should be sought at the outset only in exceptional cases where it is clear that more than 12 months will be required to complete the Administration. Although Caroline didn’t go into the technicalities of how an extension might be agreed at an early stage, it gave me cause to revisit the Dear IP article (chapter 1 article 12). It describes the “questionable” practice of seeking consent for an extension “with the administrator’s proposals including a conditional resolution regarding the extension of the administration, along the lines that if the administrator should think it desirable, then the administration would be extended by an additional six months”. Over the years I have seen this done, but I have not seen it done properly, i.e. compliant with the Rules. R2.112(2) requires requests to be accompanied by a progress report, but Proposals are not a progress report. I guess that a Proposals circular could be fudged to fit the prescription for a progress report as set out in R2.47, but this would have consequences, such as the need to file the Proposals/report with a form 2.24B (as well as filing the Proposals individually) and the clock would be re-set so that the next progress report would be due 6 months afterwards. Also, how does an Administrator meet the statutory requirement to issue a notice of extension as soon as reasonably practicable after consent has been granted, if s/he has obtained such a “conditional” resolution? My recommendation would be to avoid seeking extensions in the Proposals altogether, but instead leave them until the first progress report is due. Of course, if an Administrator has to convene a general meeting (or deal with business by correspondence) at a time other than the Para 51 meeting, this will attract some additional costs, but if the request is made at the time of the statutorily-required 6-month progress report, those additional costs are relatively small, aren’t they? Complaints-handling was covered at both the ICAEW and the IPA roadshow, which I suspect has as much, if not more, to do with the likely pressure from the Insolvency Service on RPBs as it has with any perceived extent of failings on the part of IPs. Both Allison and Caroline covered the need to explain how complaints can be made to the Complaints Gateway, although I do feel that generally RPBs have not done much to publicise their “requirements”. The only guidance I’ve seen is on the ICAEW’s blog – http://www.ion.icaew.com/insolvencyblog/post/Launch-of-the-insolvency-complaints-gateway – that refers to the need to disclose the Gateway to anyone who wants to complain and in engagement terms, if they refer to the firm’s complaints procedure. This blog also stated that there was no need to inform creditors of existing cases, which leaves me wondering what the expectation is to communicate with creditors generally on post-Gateway cases. 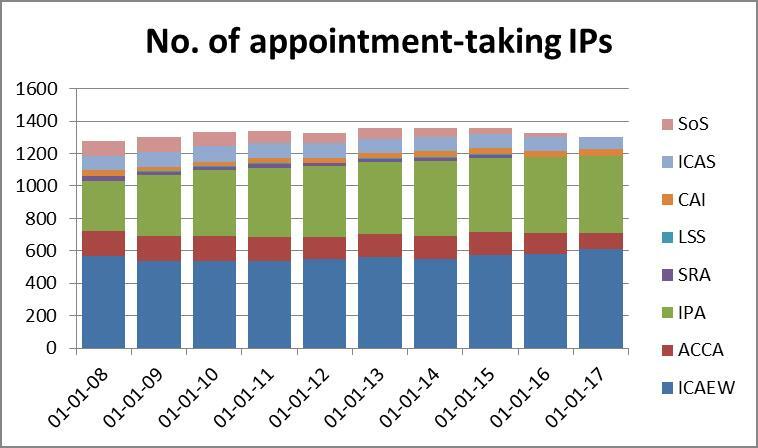 Given the Insolvency Service’s emphasis on the Gateway, I am a little surprised that the RPBs seem to be relying on some kind of process of osmosis to get the message of their expectations out to IPs. From the two roadshows that I attended, I sense that there is a general expectation that IPs’ websites will display details of the Gateway (although I hope that the RPBs will take a proportionate approach, given that some smaller practices’ websites are little more than a homepage). I do not get the sense that the RPBs expect the Gateway’s details to be added to circulars to creditors generally, but only that they should be included in any correspondence with (potential) complainants. Allison also highlighted that, whilst the ICAEW’s bye-laws (paragraph 1.2 at http://goo.gl/1frWQo) include a requirement that all new clients be informed of their right to complain to the ICAEW and be provided with the name of the firm’s principal to whom they should complain, when writing as an insolvency office-holder the need to refer parties to the Complaints Gateway takes precedence over this requirement. Caroline commented that IPA monitoring visits will include a review of the practice’s internal complaints process to see how these are handled before the complainant resorts to the Gateway. If complaints are not handled by the IP, the monitors will also be exploring how the IP is confident that complaints are dealt with appropriately. I hope that the above illustrates the value of attending an RPB roadshow. However, I think it also illustrates the risk that we learn about previously unknown and not altogether satisfying views on regulatory matters. I realise that I am not blameless in this regard: when I worked at the IPA, I also used the roadshows as a medium to convey my thoughts on issues identified in visits and self certifications, so I should not be surprised that this practice is continuing (or indeed that others hold views different to my own!). I and many of my colleagues were ever conscious that there was no other medium for Regulation Teams to deliver such messages and forewarn IPs of hot topics and evolving regulatory expectations. Dear IP was the only other method that came close, but as this is controlled by the Insolvency Service, I could only hope that the RPB perspective would not become lost in translation. The Advantage of Written Guidance? I hope that, if I’ve got the wrong end of any stick waved at either of the two roadshows, someone will shout – please? Given the limited audience at roadshows and the risk of Chinese Whispers, it must be better for the RPBs to convey their messages in written form, mustn’t it? A recent example, however, illustrates that even written communications can be unsettling. At http://www.ion.icaew.com/insolvencyblog/post/The-18-month-rule—it-s-for-real, a QAD reviewer’s blog starts by stating that “there is a suggestion from some compliance providers and trainers that the 18 month rule for fixing fees may not be definitive, and that you still have the option of applying to creditors after the expiry of the 18 month period”. I shall start by confessing that it’s not me, honest: I’ve never had cause to scrutinise these provisions. However, now that I do, I have to say that I am struggling to see how the Rules can be interpreted in the way that the Service and the ICAEW are promulgating. “Shall be entitled…” When I reach state-pensioner age, I shall be entitled to travel on buses free of charge, but that does not mean that the only way I will be able to get to town is by taking a bus. Similarly, after 18 months, the liquidator shall be entitled to remuneration on the scale rate, but does this mean that the liquidator is only entitled to fees on this basis? What statutory provision actually prohibits the liquidator from seeking creditors’ approval of fees on another R4.127(2) basis after 18 months? And how do the Rules “extend” this compulsory liquidation principle to CVLs? R4.127(7-CVL) states: “If not fixed as above, the basis of the liquidator’s remuneration shall… be fixed by the court… but such an application may not be made by the liquidator unless the liquidator has first sought fixing of the basis in accordance with paragraph (3C) or (5) and in any event may not be made more than 18 months after the date of the liquidator’s appointment.” Given that the construction of this rule is so different from R4.127(6), it is difficult to see how both rules can be considered as reflecting the same principle. And in any event, this simply states that a court application may not be made after 18 months (which seems to be precisely the opposite of the ICAEW’s blog post!). How can this rule be interpreted to the effect that the liquidator cannot seek creditors’ approval for fees after 18 months? The Rule starts: “If not fixed as above…”, so the rest of the Rule is irrelevant if the fees are fixed as above, e.g. as specified in R4.127(5) by a resolution of a meeting of creditors; I see no provision “above” prohibiting the seeking of a creditors’ resolution after 18 months. I shall be interested to see how this matter gets handled in a future Dear IP. 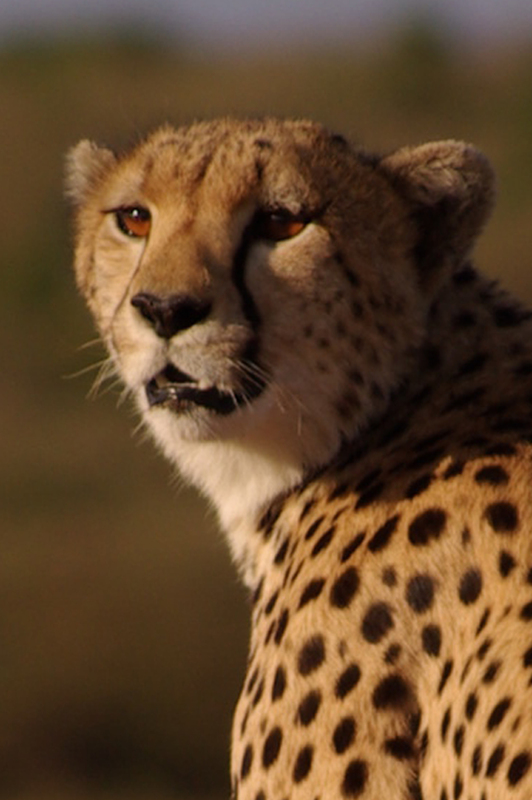 In the meantime, what should IPs do? I reckon that the only certain approach is: seek approval for fees before the 18 months are ended! 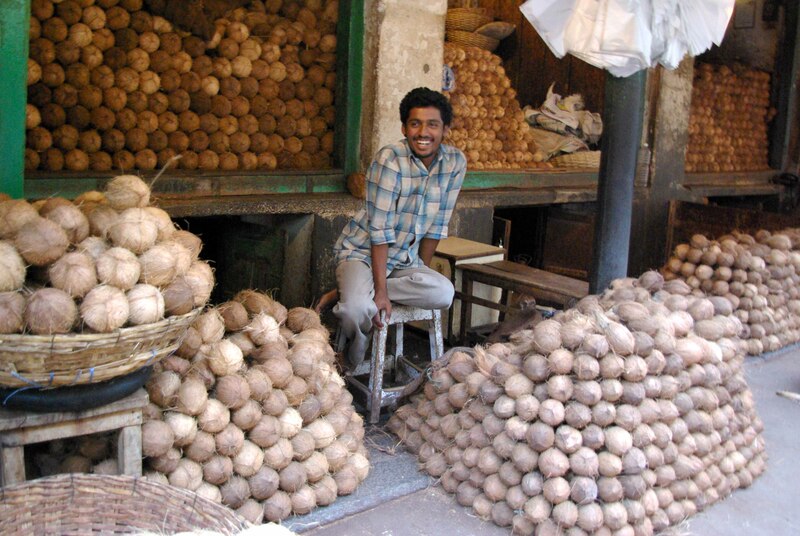 This blog illustrates to me that there must be a better way for the regulatory bodies to convey – considered and sound – explanations of certain Rules and their expectations to IPs. As a compliance consultant, I suffer many a sleepless night worrying about whether my interpretation and understanding of current regulatory standards are aligned with my clients’ authorising bodies’ stance. I do value my former colleagues’ openness and I do try to keep my ear to the ground with many of the authorising bodies – I’ll take this opportunity to make a quick plug for the R3 webinar on regulatory hot topics that I shall be presenting with Matthew Peat of ACCA in February 2015. However, I believe there is a need and a desire in all quarters for the creation of a better kind of forum/medium for ensuring that we all – regulators, IPs, and compliance specialists – are singing from the same hymn sheet. Have a lovely long break from work, everyone. I’ll catch up again in the New Year. Categories: Other guidance | Tags: administration extension, administration objective, complaints, Complaints Gateway, Ethics Code, ICAEW, IPA, liquidator's fees, RPB | Permalink.